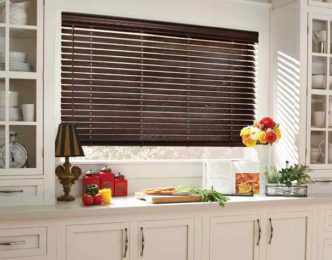 Our Parkland® Genuine Woods are precision crafted from the finest North American hardwoods, including genuine oak and cherry, and display beautiful natural grain and color variations. 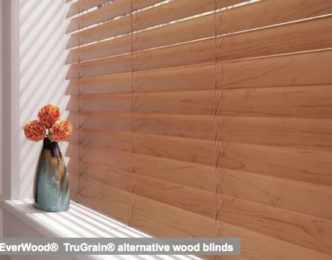 Rich colors … bright, modern stains … Parkland® Classics™ wood blinds offer our widest selection of paint colors, stains and slat sizes, so you can find just the right design for your home. 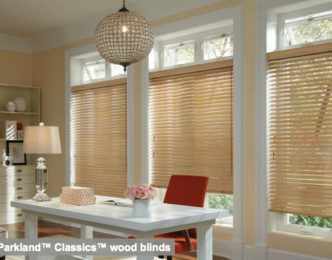 all ideal for rooms with heat and humidity. 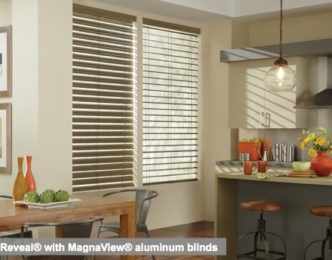 Our Natural Elements® blinds are a unique combination of aluminum slats and real wood valances, bottom rails, tassels and tilt wands. MagnaView® is optional. de-Light™ is standard.